Satish Joshi is a 1968 graduate of the New Delhi College of Art (MFA) who immigrated to the US in 1969. He taught at Riverdale Country School for 37 years, much of that time as Head of the Visual Arts Department, and added ceramics, sculpture and printmaking to the existing painting and drawing curriculum at the School. He has taught classes for elementary school to adults in painting, drawing, printmaking, ceramics, and stone and metal sculpture. Additionally, he has maintained an extensive 40 year exhibition career of his paintings, sculpture and prints in galleries and museums. Satish is currently teaching at School of the Holy Child in Rye, where he specializes in college portfolio preparation and independent study classes. 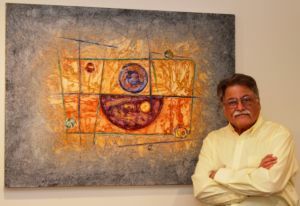 Satish’s lifelong artistic fascination with the creation of textured, layered surfaces of 2-dimensional work, along with the interpretation of light and color, have informed the artistic themes of his paintings and monotype prints on canvas, wood panels, and paper. Predominantly an abstractionist painter, he is also known for his nudes and landscapes. In steel he works in found object pieces and in “drawings on steel;” his alabaster and marble classical torsos and figures range from table-sized work to monumental scale installation pieces. Satish was a founding member of the Board of Directors of Art on Main Street in Yonkers and was on the Board of the Phoenix Gallery in New York. He taught ceramic classes for adults at Lehman College. He is on the Arts Westchester teaching artist roster and volunteers for Yonkers Partners in Education as a private art instructor for disadvantaged students. As Chair of the RCS Visual Arts Department he supervised student art teachers from Columbia University’s graduate program at Teachers’ College. Satish also teaches private individual students who wish to improve their art skills or work on college portfolio preparedness.